What is TMD OpenCart Product Manager and how is it beneficial for your Store? TMD Product Manager Quick Edit Module enhance items editing for store admin and faster time to increase your productivity and efficiency. The product manager is an Extension that helps store owners to edit their products very quickly and all changes made to a product are saved with AJAX, without refreshing page. This is very helpful for your store because It saves a lot of time as you do not need to open each product individually to edit the values and respective field/s. 1. 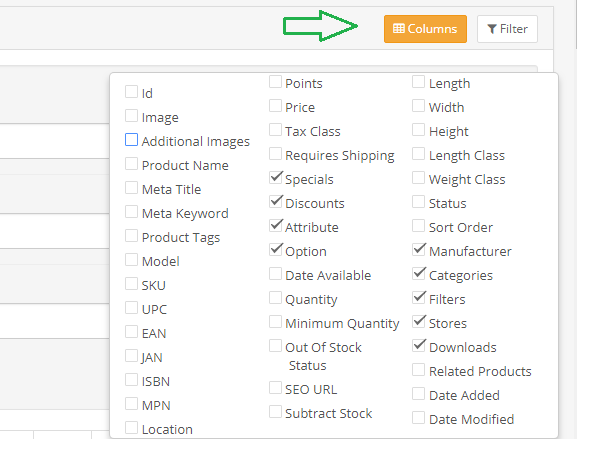 It has Select Columns Options Available in the product list page. 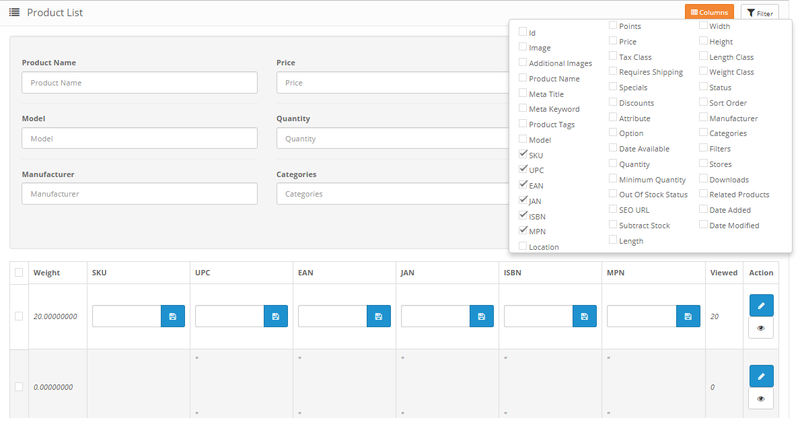 The product list page shows all the columns on the grid that you add. And this makes it easy for you to display what you want to see, rather than what you don’t want. 2. Hide the rest of the columns that you do not require. You can hide the columns that you don’t want to display. This is again a good option to hide all unnecessary item. Simply click on the column list and hide/display any item. 3. Filter options are handy in searching for products. The main function of the filter option is the search for a product. Whether you hide a column or display a new column. You need to filter a specific product to edit its attributes. You can filter your attributes on the product list from columns link. And filtered products display below the filter option. So just edit them on the grid itself by clicking on the column. You don’t need to open the edit link here. This is very helpful for the store owner to manage items in a very short time. It is obvious that you don’t want to get mess up with all the fields. So hide and display column as you like from the column link. The less you display the columns the less is the complexity. 7. Direct image links to store for add edit and upload images. Image upload is easy and convenient for you after you add Product Manager to your store. So TMD OpenCart Product Manager provides every possible option to edit add delete and upload images on the grid itself. You can also create a new folder to keep and upload your image. OpenCart Product Manager gives an option to view your product on the storefront. After you edit your product it is available to view your product by clicking the view link. And you can check your content directly if the content is a part of the front end store. This module supports multi-language option for your store. TMD OpenCart Product Manager enables multi-store feasibility. If you are running a multi-location OpenCart store. You do not need to worry about this module as it supports multi-store facility. 11. Supports All Version of the OpenCart Store. OpenCart brings updates and upgrades from time to time. So if you update your OpenCart store, there is nothing to worry about it. TMD OpenCart Product Manager is feasible for all OpenCart Store Upgrades. Ajax based loading helps your page from being refreshed from scratch. So whenever you edit a column only that column is refreshed keeping your other column data store safe. And storing of data for all other columns are done internally without any hamper.